Owen D. Nilsen, son of Ingolf and Minna Nilsen, was born in Brooklyn and lived in Springfield Gardens, New York, in 1923. A student at Andrew Jackson High School, Nilsen was a catcher for the St. Albans Americans of the Queens Alliance League. After graduating from high school in June 1941, Nilsen worked for the Phoenix-London Insurance Company and played for their basketball team. 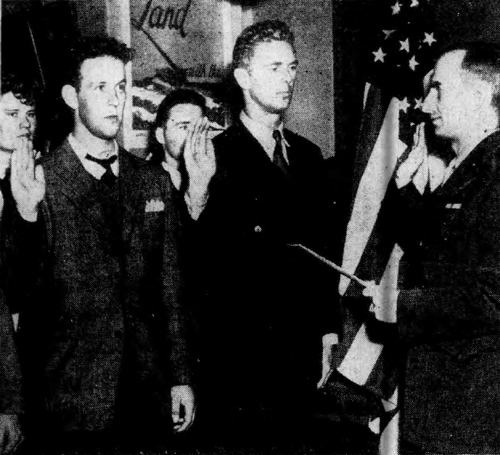 He enlisted in the Marine Corps on October 26, 1942, at the Marine Recruiting Office in New York, and was sworn in alongside movie actor Sterling Hayden. Nilsen served as an instructor on the rifle range at Parris Island, South Carolina. He was transferred to Camp Pendleton, california, before going overseas in January 1944 with the 4th Marine Division. Corporal Nilsen took part as a reconnaisanceman in the invasions of Saipan, Tinian, Roi and Namur. He was awarded the Silver Star for conspicuous gallantry at Iwo Jima on February 17, 1945, but was killed in action on March 6, aged 22. "The President of the United States of America takes pride in presenting the Silver Star (Posthumously) to Corporal Owen D. Nilsen (MCSN: 473714), United States Marine Corps Reserve, for conspicuous gallantry and and intrepidity as a Member of an Advanced Reconnaissance Team serving with the FOURTH Marine Division, in action against enemy Japanese forces off the coast of Iwo Jima, Volcano Islands, on 17 February 1945 [two days before the amphibious landings]. Assigned the hazardous mission of obtaining information concerning landing beaches and shore installations, Corporal Nilsen unhesitatingly set about the task in the face of withering barrages of hostile artillery and automatic weapons fire and, boldly carrying out the reconnaissance despite grave hazards, succeeded in gaining valuable data and information of the landing beaches which aided materially in saving the lives of other Marines during the assault landing. By his determined perseverance, cool courage and outstanding ability, Corporal Nilsen contributed immeasurably to the success of his team in the fulfillment of an important mission." Initially buried at Iwo Jima, his remains were returned home in October 1948, and funeral Services were held at the Lawrence D. Rouse Funeral Home in St. Albans. The Rev. J. St. Clair Bousum of Bethany Lutheran Church, Springfield Gardens, officiated, followed by burial at the Evergreens Cemetery in Brooklyn.His name is incribed on the Veterans Square Memorial in Queens.